The Foundation in Science programme offered at Perdana University will prepare you for the Undergraduate Programmes. The curriculum is crafted to give you a strong foundation in the undergraduate areas of study. It is also designed to give you the soft skills required for your personal development. International recognition for research-led teaching, a dynamic environment and an excellent employment record for graduates make Perdana University your ideal destination to pursue a medical degree. 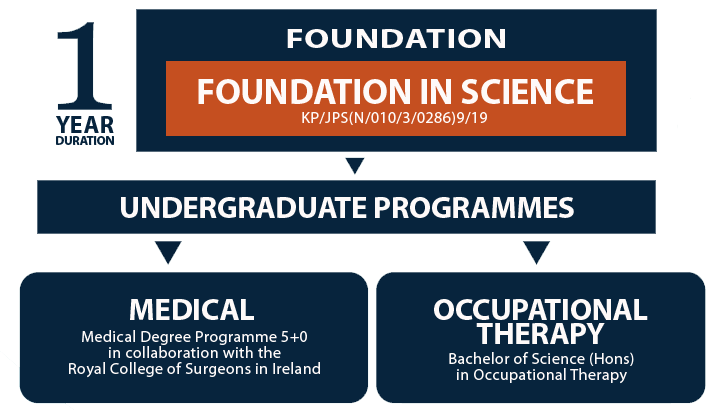 Our Foundation in Science programme offers the perfect first stage of this journey. As a one-year intensive access course for students without A-Levels, it will prepare you academically and socially to start an undergraduate science degree. Successful completion of the Foundation in Science programme guarantees progression to full degree-level courses at Perdana University, which offers expert teaching staff and world-class facilities. Providing a solid background in science and transferable academic and life skills, the programme is designed to prepare you for a rewarding university experience, as well as being an important step towards an exciting and lucrative career. All of our modules are designed and taught by University lecturers and are therefore tailored with your future degree in mind. Students who have an IELTS score of 6.5 or below will need to study our International English module in place of one of the above. *SPM / O-Level: 5Bs each in Biology, Chemistry, Physics, Mathematics / Additional Mathematics and another subject. Students who excel in the exams listed in the Admissions Requirements are eligible to apply. Kindly contact the Department of Student Life for detailed information on the scholarships available. I have not obtained the final results for my SPM but based on my forecasted results, I do not meet the requirement for any of the programmes. Can I still submit my application? We would advise you to submit your application form, but we will not process your application until we have received your final SPM results. The application fees will only be charged upon confirmation that your final SPM result has met our entry requirement. Yes, we are offering a RM1,000 scholarship for every “A” you get in your SPM (regardless of A+ or A-), for a maximum of RM9,000. In addition, if you have 7 “A”s and above, you will receive this maximum (RM9,000) amount. We have 3 intakes a year, which is April, July and September. If I can’t get into the medical course and I do not like occupational therapy either. What are the other options I have? As our foundation course is accredited by MQA, you may look for other degree courses in other universities locally and this is subject to approval by the respective universities.